Mike Forsyth from WasteAway Recycling & Environmental, and Russ Cogar from Vermeer Canada, on site in Ontario with WasteAway’s HG6000 HOG with Damage Defense system. The well-crafted team has taken the company's owner 10 years to develop. AGI was started in 2009 by Dan Forsyth when Ground Force Environmental opened its doors. Along the way, the trucking company was added, and land for WasteAway was secured in 2012. It would take an additional three years for the organization to obtain all the necessary permits and develop the 14,400-square-foot building (1337.8 square metres) to house their waste recycling operation. Today, Forsyth's vision of creating a complete operation that could process recyclable material for beneficial reuse, while helping the environment and saving landfill space, is a reality. Starting with a team of five individuals, AGI now has more than 100 full-time employees. Each of the company's three divisions works together but operates separately. Ground Force handles the bulk of the work on waste generating sites. Then, construction debris and other materials are hauled by RCT Bins' fleet of trucks to the WasteAway facility for processing. If a project calls for land clearing, WasteAway will send a crew to the site to grind material using its Vermeer HG6000 horizontal grinder. WasteAway’s HG6000 horizontal grinder is set to grind material to under 7.6 cm in size providing a production rate of 182.9 to 228.6 metres per hour. According to Mike Forsyth, operations manager for WasteAway, this machine does spend a lot of time in the field, but is also essential back at WasteAway's recycling facility. "We replaced a couple of smaller machines with the HG6000 horizontal grinder in 2016," explains Forsyth. "All of the wood waste we receive at our facility is processed with that machine, and we also send it frequently out to the field. We depend on the machine for a lot of things. "The wood chips processed through WasteAway's HG6000 grinder get reused as biomass for making animal bedding and for creating material to absorb liquid waste. "Our biggest customers of the processed material are ourselves (Ground Force), followed by greenhouses and the farming community," explains Forsyth. "It's pretty cool how we're able to reuse the bulk of the waste we collect. It's what makes us a great team." The WasteAway HG6000 horizontal grinder is set up to grind material to under 3 inches (7.6 cm) in size using a hex-shape screen. Forsyth says their setup creates the right size material for their biomass needs and helps separate nails and other debris, while still giving them a production rate of 200 to 250 yards per hour (182.9 to 228.6 metres per hour). Managing an increasing amount of wood wasteSince adding the Vermeer horizontal grinder, the amount of wood waste and processing work being done for other companies has increased dramatically, and oftentimes the raw material isn't as clean as what Forsyth would like to see. Not catching contaminates, especially metal, was causing increased maintenance on their machine. "In the beginning, it was easy to pre-sort through the wood waste material by hand and remove any non-wood debris," he explains. "However, as we've grown, so has the amount of waste we're taking in, which has made sorting through everything impossible. It's also not a realistic expectation to ask customers to make sure there isn't any non-wood material in their piles when we're working at their locations." Vermeer’s Damage Defense system is designed to reduce the likelihood of damage from metal contaminants entering the hammermill. 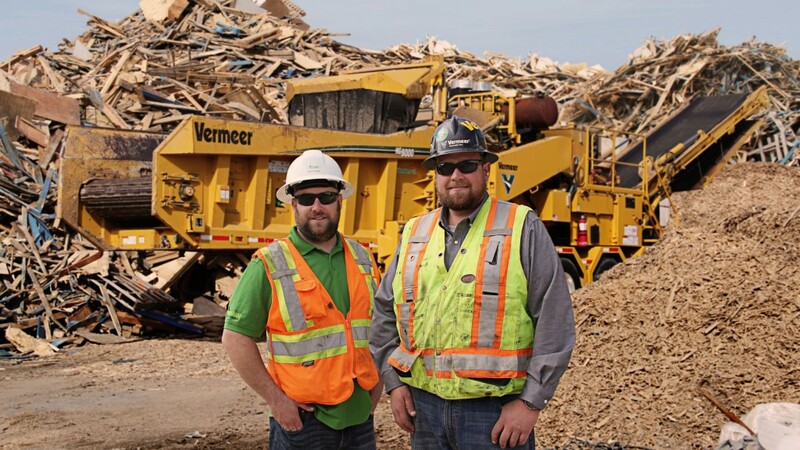 Determined to come up with a viable solution to catch more contaminate debris before it goes through the hammermill, Forsyth reached out to his local Vermeer recycling and forestry specialist, Russ Cogar with Vermeer Canada. "Russ told me about the Vermeer Damage Defense system for horizontal and tub grinders," says Forsyth. "It sounded like a great solution for the issues we were having, and it was much more practical than some of the other options I was considering, which included having to thoroughly pre-sort everything." According to Cogar, the Vermeer Damage Defense system was launched in early 2017 to reduce the likelihood of significant machine damage caused by some types of metal contaminants entering the grinder's hammermill. "The system will alert the grinder control and operator and automatically initiate the shutdown process if the mill comes in contact with the certain metal contaminants," Cogar explains. "It can be an effective solution for contractors who have a lot of foreign debris mixed in with their wood waste." Forsyth thought it was exactly what he was looking for and the team from Vermeer Canada installed the Damage Defense system on WasteAway's HG6000 horizontal grinder in the summer of 2017. "It didn't take much time for them to complete the install," he notes. Forsyth says the Vermeer Damage Defense system has significantly helped optimize the performance of their HG6000 horizontal grinder. "Now, we wouldn't think of running the grinder without having the Damage Defense system engaged," he says, adding that with the Vermeer Damage Defense system helping to optimize productivity, WasteAway's HG6000 horizontal grinder operates more hours every month, allowing their two-person grinder crew to stay productive at their facility and while on customer jobsites. Forsyth concludes that it's been a wonderful experience to help his father (Dan) and founder of the business make his dream a reality. "The business has come a long way from when I started working at Ground Force in 2014," he says. "We've added other businesses to support his vision, and we've set up the WasteAway facility to thrive as recycling becomes common practice in the waste industry. We have the equipment and people to handle separating different types of recyclable material and have already demonstrated that we can create a second life for the waste we collect. "I believe we've established three organizations that will continue to lead the industry into the future." This article was originally published in the November/December edition of Recycling Product News, Volume 26, Number 8.